A few years ago, on a trip to Montreal to visit a friend, I happened by this plant in the Montreal Botanical Garden, Pennisetum macrourum. It was love at first sight. Just look at those amazing, tall stems...those fabulous white flowers, catching the light so elegantly...waving in the slightest breeze. Try as I might, however, not only couldn't I find them for sale anywhere...I really couldn't find any good information about them. How hardy were they...what were their water requirements? Amazingly, just as I'd sort of forgotten about them, I found them! There they were, at the Wind Dancer Garden booth, at the HPSO Plant Sale last fall...sigh...remember where there was a FALL plant sale :-( I snatched one up instantly...I was ELATED! Of course, I wanted at least 2 more to create a decent patch of them in my garden...so went down to their nursery outside Salem to get them (and a few other grasses as well)! 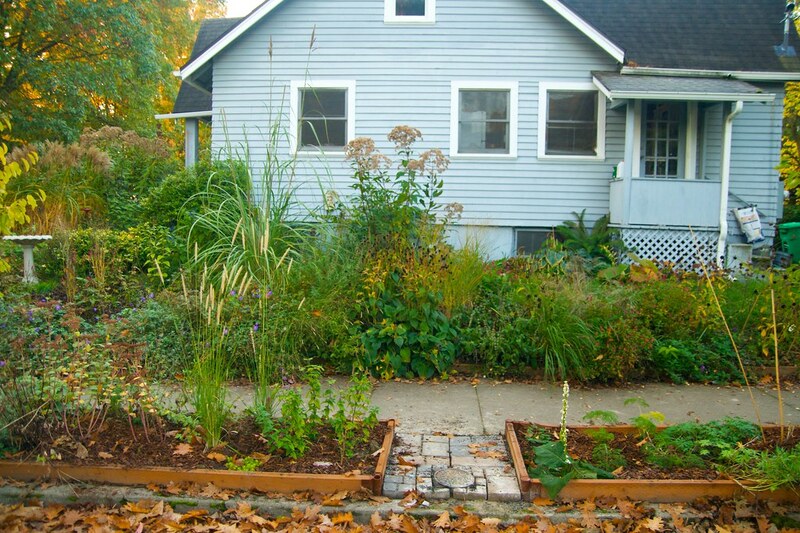 Here they are shortly after planting last fall (toward the bottom, just left of center). From what I had learned from Carolyn Kolb (owner of Wind Dancer) they were pretty tough...and fairly drought-tolerant, once established. Fall planting seemed perfect...since our mild winters make for good root growth, plants can get comfortably established and be ready to grow once spring rolls around. Seen here in October...I was already loving them...they offered such a delightful textural highlight to the garden...I couldn't wait to see how they performed the following year. This Pennisetum surprised me by being evergreen throughout the winter. Then again, it was an unusually mild winter, so it may not be typical for them to stay green during most winters...we'll have to wait and see. They form an expanding clump of VERY tough grey-green leaves. Sadly, I can't barely see the clumps themselves in my garden, since they are buried underneath a very exuberant Geranium. It doesn't seem to diminish their vigor, however. They grow tall quickly...the leaves only get about 2.5'-3' tall (at the most) but the blooms, which start emerging as early as June, elongate until they reach about 6' tall. The blooms are, in a word, incredible! They start blooming from fairly close to the clump, but as the stems elongate, they fade from a creamy beige/tan to a glistening white. Line many grasses, the blooms are amazing at catching the light...they are magical when backlit...seeming to glow, especially against a dark background. 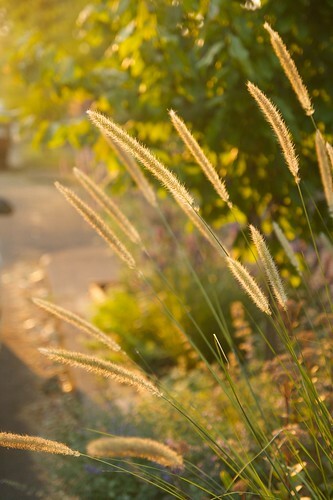 I always try to get outside during the early morning and late afternoon hours so I can enjoy the play of light on the garden...and this Pennisetum is often the star of the show. I should mention that, in addition to its beauty, it's VERY low-maintenance. I have these planted in the hell-strip on the side of our house and they've only been watered a handful of times all year (and usually only when I'm watering something else). So, there you have it, and incredibly beautiful grass...one which I can imagine in a million different scenarios in the garden. 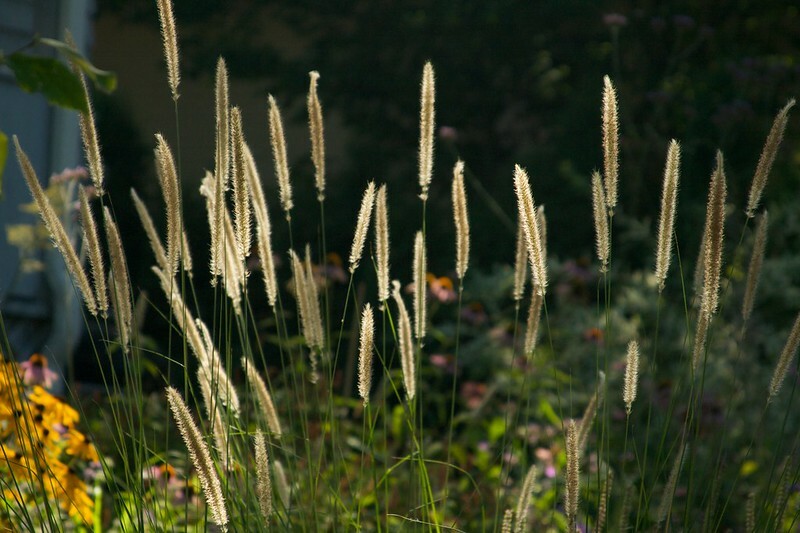 If you ever need a tall exclamation point in the garden...try this grass...I doubt you'll be disappointed! I'm looking for a new ornamental grass and this is a beauty. Right now I want something shorter, though. Can you recommend any that grow to about 3' with seed heads? 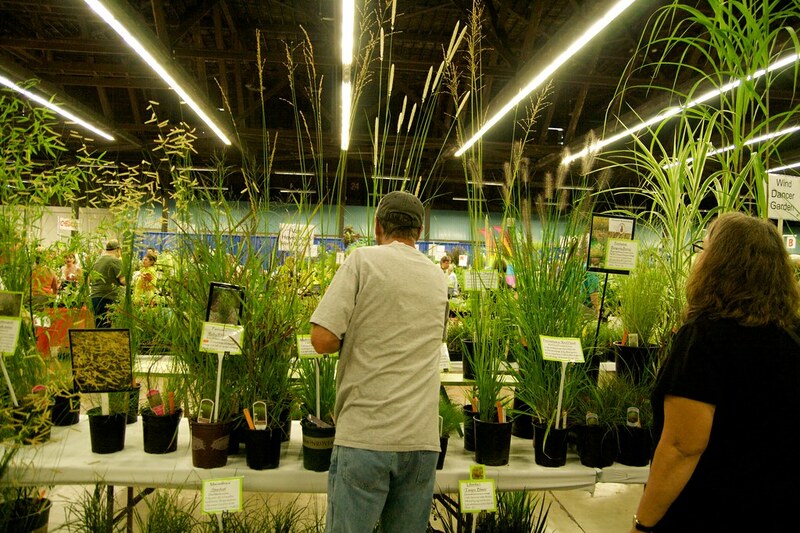 I was thinking of a dwarf fountain grass, which I think is also a pennisetum. In any case, I'll file this one away for future reference. Thanks for the post! The stems are wonderful. Sure makes an impact on the garden. Goddamn it, now *I* need this grass! You are definitely going to get us all hooked on grasses. 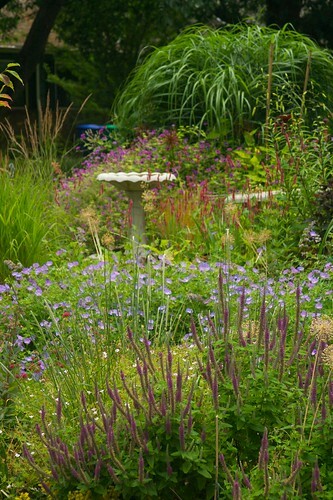 Your photos of your garden and others sure highlight them well. I hope so...they are still so under-utilized in so many gardens! Wow...things have really filled in since that picture from last fall. Incredible grass...want! hahaha...I know...Portland is kinda crazy that way...things grow so big, so FAST! Definitely tracking one of these down for fall planting this year. Thanks for the tip! I hope you can find some, Alan...I can try saving some seed too...not sure how easily they sprout...but that's how the owner of WInd Dancer propagated these (the ones she sold me were only 2 years old...so they must grow FAST)! Oh, I've been looking for some grasses to plant in that bed where I took out the two trees, I bet this would be spectacular there. Does it flop at all? I have Pennisetum 'Karley Rose' and that is quite floppy. That's one of the best things...even though it's quite tall, it's very rigidly upright...no flopping at all (and yes, wish I could say the same for Ms. Rose)! Can you hear my sigh across the miles...Such loveliness! It's a shame they aren't fully hardy here, although I may just have to try my luck! Thanks, Gwirrel...I always have my eye out, that's for sure! I'm not entirely sure of their hardiness...I wonder what the folks in Montreal do...it certainly gets COLD up there! 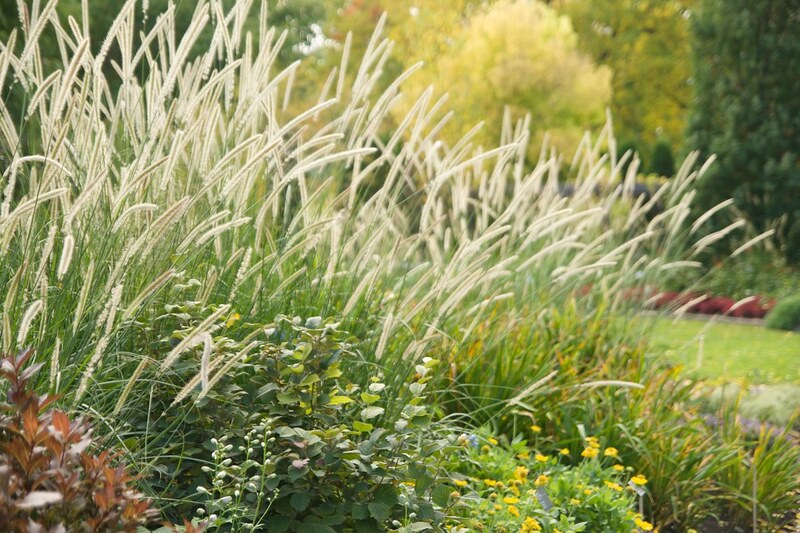 Looks like a good warm season substitute for Karl Calamagrostis. Gorgeous grass, definitely crush worthy. I've avoided pennisetum because I'm not sure about drought/heat tolerance but I might try to find this one. It is a good punctuation point for the garden. I think you might have good luck with these...they really seem pretty darn tough! I've never seen it in nurseries here in Northern California either. What a beauty! I'm always looking for compact grasses and will keep my eyes peeled. Thank you for the introduction. I hope you can find some...I know John Greenlee mentioned it a few times in a talk of his I attended a while ago. Great looking grass. Thanks for the review. Ooo-wee this looks like an excellent small garden alternative. I am digging out 'bunny tails' as we speak..though I love it, the footprint is just too big. It has a beautiful growth habit, not flopping in the least. I know...that's one of the best parts...it's VERY rigidly upright. I love how you've captured the light against them. I planted grasses for the first time last year. 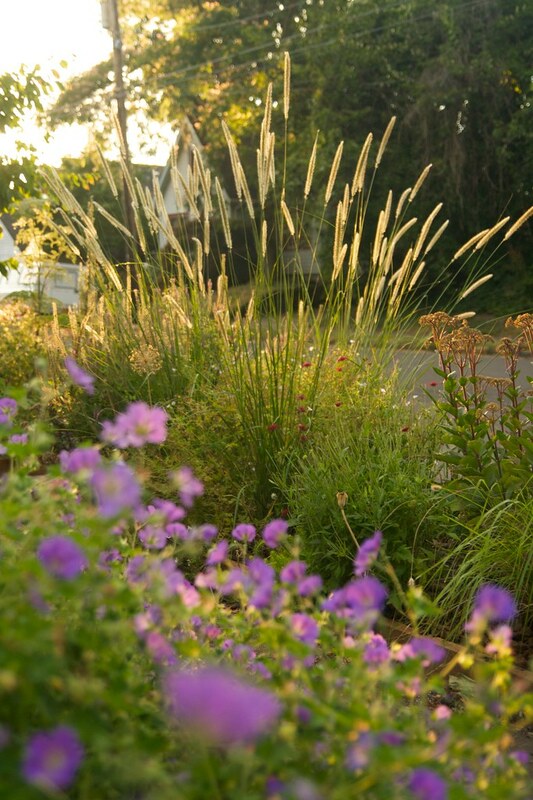 Your post makes me covet the pennisetum. Yay! Which grasses did you plant??? Great photos of this wonderful grass. 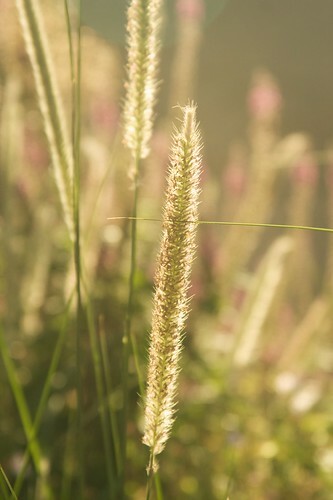 I love watching the morning and evening light on the grasses but have yet to capture it on camera well. Don't you just want to jump for joy when you FINALLY find the plant you've been searching for! Me too...those moments in the garden are so satisfying..and YES...it's so amazing to find that sought-after plant you've wanted! I can see why you like it. It is beautiful. Hahahaha...sounds like you've got your hands full! I hope you can find some seeds for it, I think you'd really like it. I've actually been thinking of adding some P. villosum as well! I saw some for sale last weekend and kept putting it back down...grrrr. Excellent! I've always loved Pennisetums, even as they've become over-used. There's a huge difference in cultivars. I really abhor all the dwarf varieties. They are always so stunted and their inflorescences are so stubby compared to the elegantly drooping straight species (P. alopcuroides). But like you, I've found myself lusting for some of the other species. My latest pennisetum crush is on P. massaicum. Very compact, but small inflorescences are held at the ends of very erect bracts, almost like fountain grass got crossed with a Juncus. But its only hardy to Zone 8 (I'm 7) so I'd have to grow it as an annual. There's so little information on these. Do you know its hardiness zone of macrourum? It is fabulous. Thank you for sharing. Yeah, I'm not really a fan of "dwarf" anything. I don't really like it when plants are all bred to just look like little green lumps...what's the point! I just got P. massaicum this spring, myself! I wonder about Pennisetum spateolatum for your zone (I think it's technically hardy to zone 7). The foliage forms a fairly low clump, but the blooms stems arch out another 3 feet or so...and hold tiny little blooms on the end...google it...it's stunning!!! P. Macrourum is, I believe, hardy to zone 7...although you're right...there isn't much info out there about them. 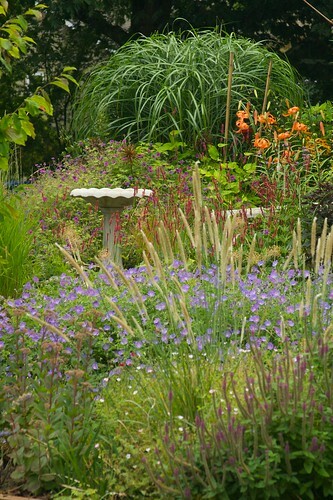 I'm referring to the recent Greenlee book (Designing With Grasses, I think) for the hardiness. Looks like a winner to me! Especially with the oblique light, as you say. I need to get out in the garden in the morning more. By late afternnon, it always seems so hot and I'm so tired. You sure do have some exceptional grasses growing in your garden, Scott! Oh yeah, I remember that feeling, back when I lived in the Midwest...there was nowhere I'd rather not be in the afternoon than OUTSIDE...so hot! Saw the grass and immediately thought of a wild section on the island of Montreal where I used to walk where a different version (smaller) grew and bloomed with the asters. Was delighted to read that you'd been to the Montreal Botanical Garden and discovered this stunning grass. Obviously once it gets its roots into the heavy grey clay soil in Montreal (combined with the snow cover) it isn't going anywhere, even if its first home was somewhere in Africa. B.
p.s. Only someone in garden heaven would semi-whinge that a geranium's blossoms were obscuring grass foliage. What a giggle - am half thinking about printing off the photo and showing it to my 'Rozanne' and her 5 flowers. Scott, they are really lovely in your garden and other gardens in temperate countries. 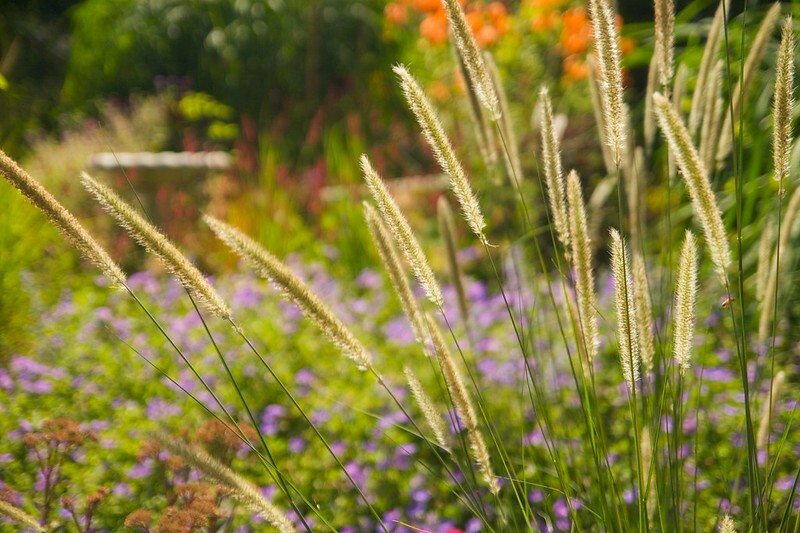 We have a lot of similar grasses here, but it is seldom that they are used in gardens. 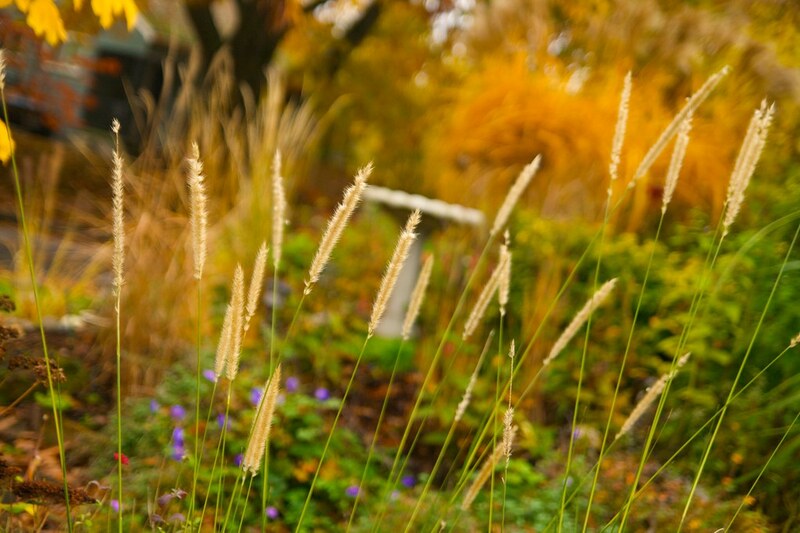 I believe it is because grasses produce a lot of seeds which invades a wide area and will eventually be a problem. That might be the problem when there is no winter which kills the unwanted. So very true, Kalantikan, I know there are quite a few grasses that we can enjoy here that are the BANE of other's lives. 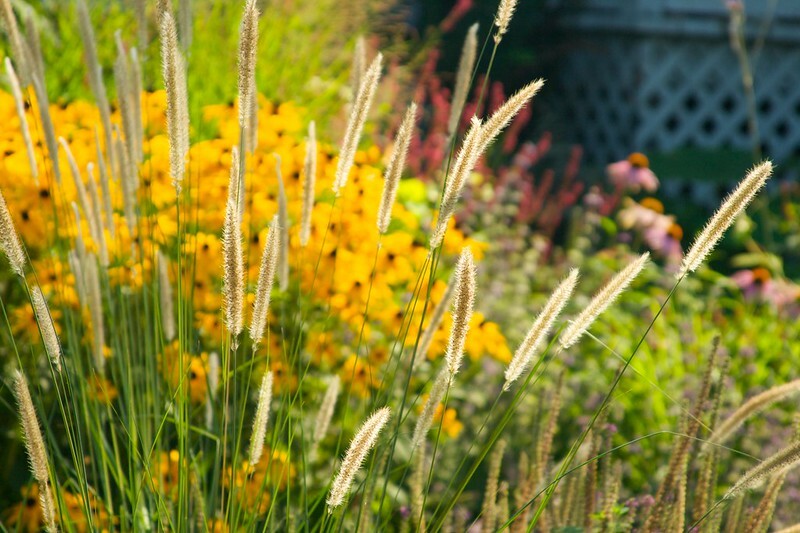 California and Florida, in particular, have problems with many Pennisetums and Miscanthus. Then again, here in the PNW, we have Buddleia to contend with! you are so convincing - I might just have to try some of your tall grass favorites. I spend most of my time pulling grass OUT of my flower beds. beautiful photos as always. Hahahahaha...you're probably not alone there, David, there are some pretty bad weedy grasses out there. Give them a try, I think you'll be pleased! Need more of this grass!! This ORNAMENTAL GRASS! Hahahahahaha...you definitely need this one, Riz...I can only imagine the amazing designs you could come up with! It's definitely a rarer form of Pennisetum, to be sure, and Wind Dancer is the only place I've found it for sale...it's even kind of rare to find it online. Don't you love it when you find a plant you've been looking for? I think you've got a real winner here. I love that most of its bulk is vertical so it takes up very little soil space. Great find. OMG...it's kind of amazing, isn't it Grace! I could actually feel my heart racing just a bit. I agree, the fact that it's so narrow and vertical is it's best asset...makes it so easy to pop in a small space and get some great drama! Grasses are wonderful the way they wave around in the wind, you have a very nice garden there. I totally agree, Karen...that's one of their best features, they bring so much life and movement to the garden...they are like living kinetic sculptures! What a lovely lovely grass. It looks wonderful in your garden. Looking forward to photographing it, and need to find a nice sheltered site for it so it doesn't die if we have a hard winter.